The original Brooks Launch was one of my all-time favorite running shoes. I started running in them in 2009, and ran a breakthrough PR in the (frigid) 2010 Disney Marathon with the Launch on my feet. They were simple, lightweight, soft in the heel, incredibly smooth, and the red/orange color combo looked amazing. They were also among the first wave of non-stability shoes that I owned, thus they spent time on my feet during the beginning of my journey toward lighter, more minimal footwear. Let’s start with the specs. My size 10 Brooks Launch 2’s weigh in at 10.2 oz on my scale, which is 0.3 oz more than the original. Not a big difference. 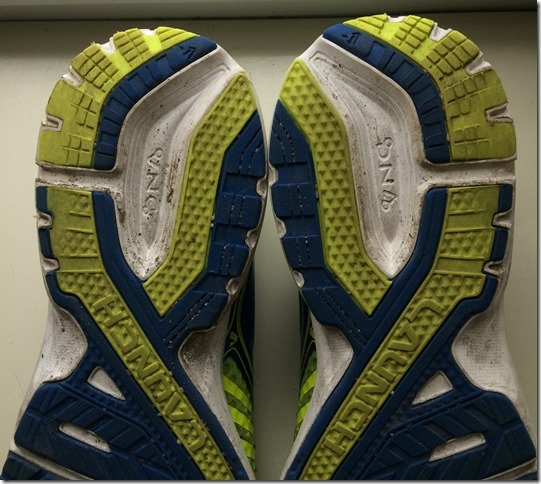 Stack height (via Running Warehouse) also remains the same at 27mm heel, 17mm forefoot, for a 10mm drop. Brooks Launch 1 (top) and 2 (bottom). I’m going to comment briefly on appearance simply because the original Launch was one of the best looking shoes I’ve ever owned. The red/orange colorway was stunning. 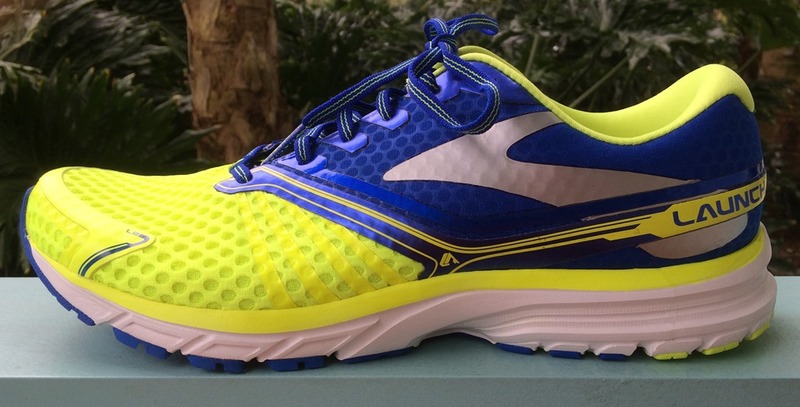 The Launch 2 comes in two color options for men right now: black/gray (boring) and blue/yellow. I opted for the blue/yellow version since I’m of Swedish descent and love the combo. They look great compared to most shoes in my current rotation, but I might still give the nod on aesthetics to the original. It’s tough to compete with a classic. 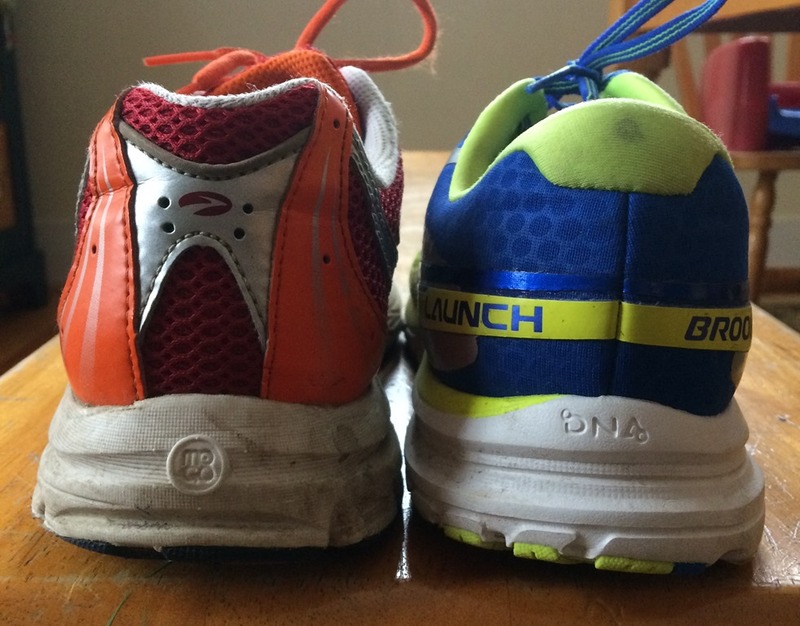 In preparation for writing this review, I went up into my attic, dug out my original pair of Brooks Launch, and took them out for a run. I also tried them on side-by-side with v2. My sense is that length is pretty similar between the two versions. I wear a size 10 in both, and have about a thumb’s width between my big toe and the tip of the shoe in each. The biggest difference I notice with regard to fit is up front – v2 offers a bit more volume for my toes. It could be the more elastic mesh over the forefoot, or maybe a slight change to the shape of the toebox. Whatever the explanation, I prefer the fit of v2 overall. One of the big differences between the uppers of the two versions is the overlays. Launch 2 gets rid of the extensive stitched overlays of the original and replaces them with welded overlays. I like this change as you could feel the stitching internally in Launch 1 – the interior of Launch 2 is softer and smoother. I also prefer the aforementioned forefoot mesh in v2 – it has more give than the corresponding mesh on v1. Finally, the heel collar and tongue differ a bit between the two shoes. The heel collar of v2 is lined by a softer material, and the tongue is a bit more padded. The top of the heel tab is also more rounded in v2. I can’t honestly say I have an opinion one way other other on these changes. Both versions also have a prominent plastic heel counter – did not cause any trouble for me in either shoe. Overall, I’d probably say that I prefer the upper and fit of Launch v2. It offers just a tad more wiggle room up front, fewer stitches, and an overall softer feel. Whereas I preferred the upper of Launch v2, I prefer the sole of v1. What I recollected most about the original Launch were the smooth ride and the soft, forgiving heel cushion. When I took them for a refresher run last week they still felt great (apparently sole cushion can hold up for 4-5 years in an attic! ), and I was reminded of why I loved them so much. 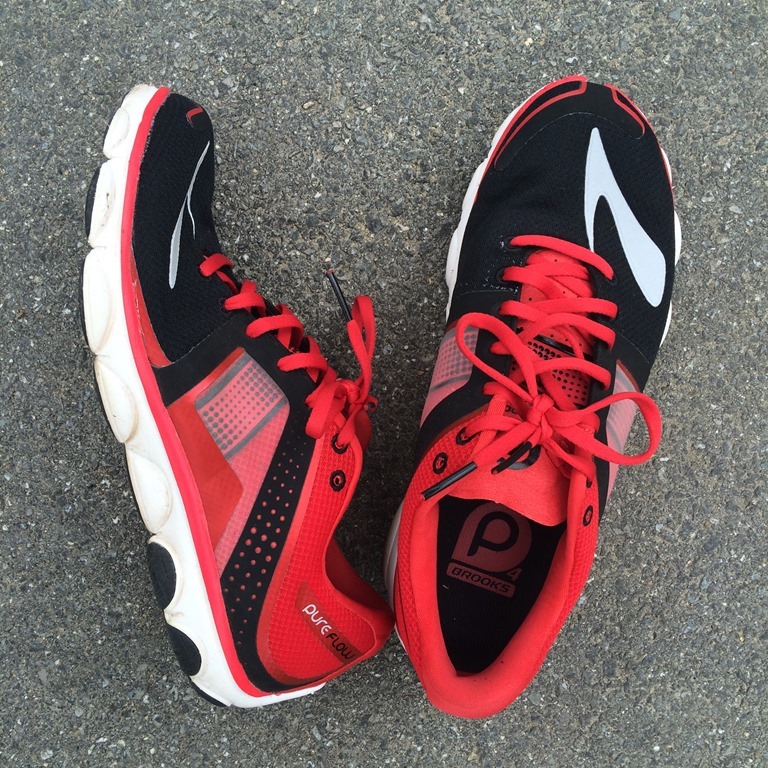 The Launch 2 feels just a tad firmer to me under the heel – it just doesn’t have the same level of cush. I’m not sure if it’s the substitution of a DNA/BiMoGo blend for BiMoGo in the heel of v2 or some other aspect of the sole construction, but v2 ride was not as much to my liking. I should point out that perception of cushioning can be highly variable, and Becki Pierotti over at The Middle Miles thinks Launch 2 feels softer than the original. Best to try it and come to a verdict for yourself I guess. I’d describe the ride of the Launch 2 as semi-firm. It’s not as firm a ride as a shoe like the Saucony Breakthru, which is a close competitor in terms of price and position as a lightweight trainer/marathon racer. It’s still a pretty smooth riding shoe though, and I’ve enjoyed running in them. It’s just lost a little of the magic that made the original so special. Like the original Launch, v2 has a full coverage outsole. One area of concern that I have is that I’m seeing pretty rapid wear of the outer margin of the heel (see photo below). I tend to contact first on the heel and scuff a bit, and load under my midfoot to forefoot, and the abrasion on the outer heel has taken a toll after only 50 miles. If you tend to chew up the heels of your shoes you might not see a long life from these – I’d guess a max of 200-300 miles for me. That’s about what I got out of the original. Interestingly, I saw a similar rapid abrasion in the Brooks Ghost 7, and both exceed what I tend to see in other shoes. Could just be that both are more shoe than I usually tend to run in, or might be something about the rubber that Brooks uses in the outsole. Updating a classic can be a challenge – in an effort to improve a shoe you always risk messing with something that people like. 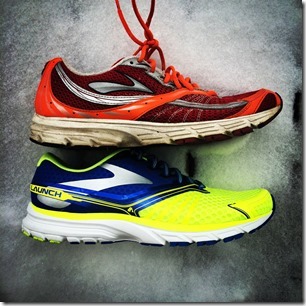 For me, the Brooks Launch 2 takes a step forward with the upper, and a step back with the midsole. Put the v2 upper on the v1 sole and you’d have one fine running shoe. But this is my personal preference coming through – I prefer shoes with a tad more cush under the heel. As it stands, the Brooks Launch 2 should appeal to those looking for a no-frills, semi-firm trainer with enough cushion to handle long miles on the road. It would also be a worthy marathon shoe. It’s worth noting that the Launch 2 is quite reasonably priced at $100 MSRP – shoes in that price ballpark are getting harder and harder to come by. The Brooks Launch 2 is available for purchase at Running Warehouse and Zappos. Purchases from these retailers help keep this site running – thanks for your support! 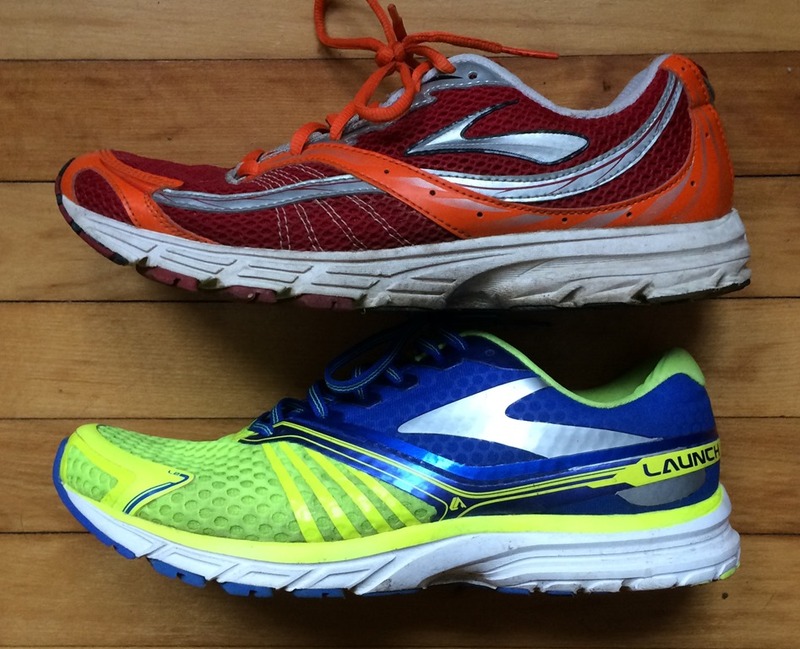 For other takes on the Brooks Launch 2, check out reviews by fellow shoe geeks Gordon Harvey and Becki Pierotti. Thanks Pete. Very interesting. I’ve had my eye on these shoes for a while. How would you compare them to the NB 1400 (a shoe I know you’re also fond of)? Cheers. The Launch is a lot more shoe than the 1400, feels more like a traditional trainer to me whereas the 1400 has more of a racing feel. I prefer the 1400 between the two, but I like less shoe. Also, 1400 has a softer heel which I prefer as well. I bought a pair of Launch 2 after reading so much about the original Launch. Great shoes, really comfy and the fit is perfect for me (went up a 1/2 size, as I do in almost every running shoe model). However, there is 1 niggling complaint I have. 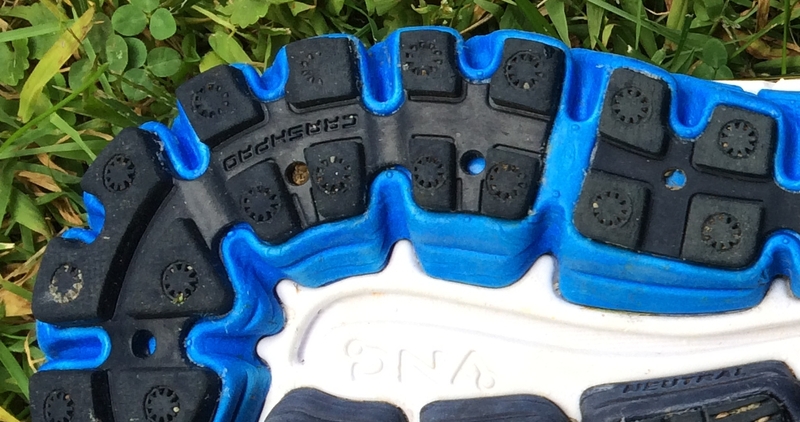 On the left shoe only, about midway up the laces, even with the laces loosened a bit, during runs the upper seems to “bite” into the top of my foot. This only happens on the left shoe. I have tried tugging on the tongue, loosening the laces, wearing different socks… nothing works. Basically, as I’m about to toe off on my left leg, and my left foot has a slight angle in it with the top of my foot over my toes, the shoe sort of digs into the top of my foot. No big deal, but it can be uncomfortable over a run of 5-6 miles, and this does not happen on my right foot. Happens on the left during every run. Just wanted to share in case anyone else has experienced this. And sorry in advance for the crummy explanation. This “biting” into the top of the foot is why I like my launch 1 so much more than launch 2. Actually launch 2 turned out to be one of most uncomfortable shoes I have owned just because of this biting. Thanks for this comparison of the two versions of the best darn running site ever made. I just popped a hole where my pinky toe hits the mesh in my second pair of launch v1’s. It was my second pair to date. 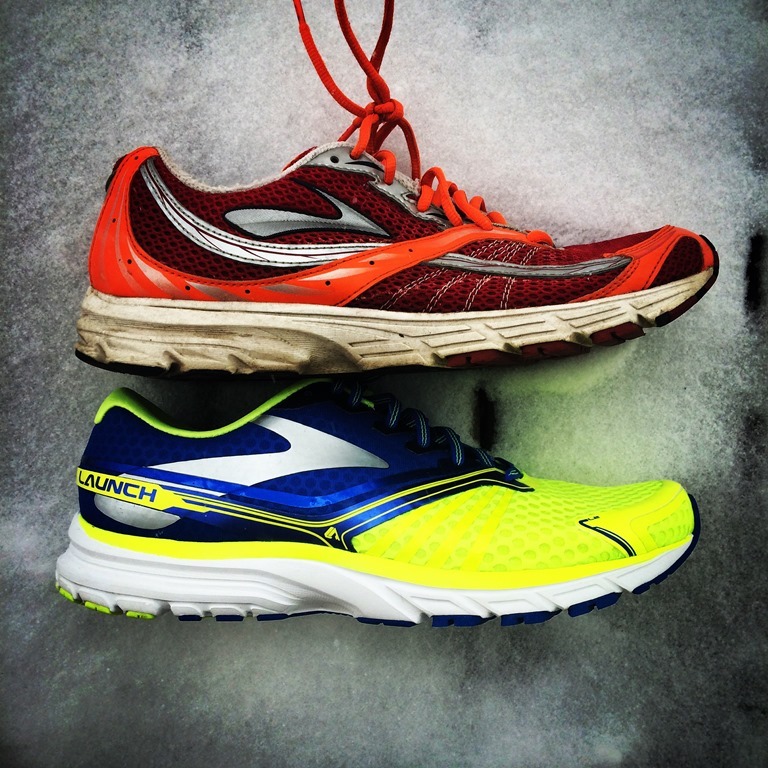 I came from wearing the mizuno wave riders and never looked back after my first pair of launch. I was upset when Brooks decided to discontinue them and wrote them nasty letters. As you mentioned these shoes give your forefoot plenty room to spread and that’s what separates the launch from the glycerin line (besides price). I also agree after putting 3 races in the v2 that the upper is better but the heel cush is lacking. I’d say it’s better than ghost’s but not as forgiving as the launch v1. God, those things are like walking on pillows! BTW, I got the Mako black/white (boring) combo and love em. I not wish they made a pair with a grey or black sole as I like to run on gravel sometimes. Thanks for the very detailed side-by-side comparison. I actually like the color combination of the updated pair and a friend bought it shortly after launching. She has no regrets so far!